I think many would agree with you. It's probably a major reason he was under consideration. What probably tipped the balance for the WRU is that Pivac knows the Welsh set-up. Also, he has a working relationship with Stephen Jones, and the WRU would like him to develop. I do think the Glasgow vs Scarlets semi-final result played a part too, even though a one-off game probably shouldn't. Another poster earlier in this thread said that Rennie got his pacing wrong last season, becaise he wasn't familiar with how a season pans out (the to-and-fro of domestic games and Europe, coupled with losing players to international duty). The same poster thinks Rennie has been more adept at squad rotation, so we'll see if Glasgow can maintain standards deeper into the season. Rugby Fan wrote: Wales considered Rennie by all accounts. It probably didn't help his cause much when Pivac's Scarlets handily beat Rennie's Glasgow in last season's Pro14 semi-final. One of the main advantage's Pivac has is he worked with a lot of the Welsh squad anyway. The disadvantage is that he will almost certainly take Stephen Jones with him, which means the strongest Welsh team has to undergo a management reboot (Jones wasn't named as the new Scarlets coach, so it is assumed he'll go into the national set-up). Rennie may well get a shot at a national team in the future but you'd imagine he'll need to show a bit more form to convince some unions. Todd Blackadder was well-regarded when he came over but his stint at Bath has not been impressive. Didnt an understrength glasgow just beat scarlets? And arent glasgow top of the table os is that justva mirage? My point being that Rennie has a far better pedigree than Pivac and his Super form is essential when considering a coachibg position. Pivac wouldnt winna post over Rennie here so for part of that equation we have already done some of the spade work for you. Most of it actually. Only problem with this logic is it looks at the two coaches as they were not as they are. By your logic if it came down to picking Cotter or Schmidt you'd pick Cotter for a Super Rugby role because back in NZ sure Schmidt was just an assistant. Would you take Blackadder over Pivac for a NZ coaching role. Rennie took a strong Glasgow team and failed in both competitions. He won the Conference yet lost at home in a semi final after a weeks rest. He also fell apart in the Euros and had no idea how to play in it. I expect Glasgow to make the quarters this year but to show again that he hasn't worked out how to beat the better teams. Munster, Scarlets and Leinster are all head of Glasgow in terms of smarts and that's coaching. The real question for me that comes out of these graphs is: what is the correct size of a player pool? 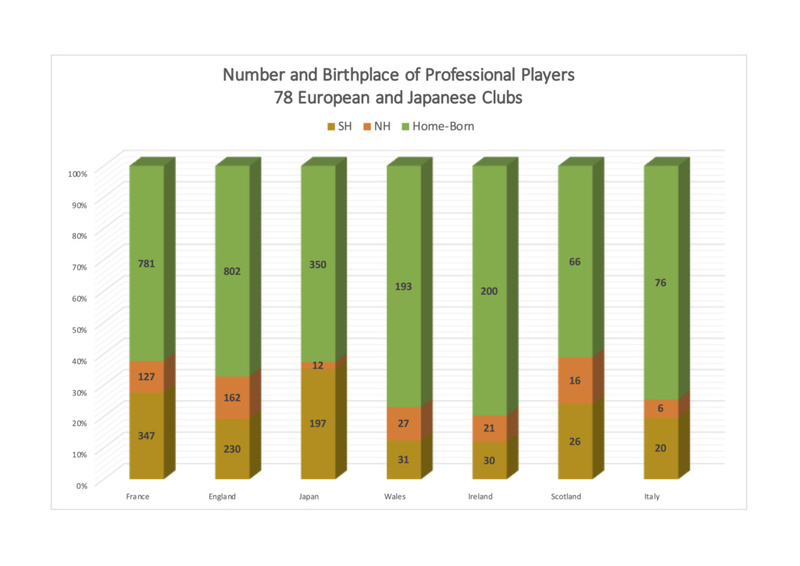 Looking at the first graph (and for simplicity ignoring English players overseas, ignoring that some England players will be born overseas and that some overseas born players will play for England) England have 461 players to pick from in a league of 690 - 67% of the league. Ireland (as an example, and Wales return similar numbers) have 202 players to pick from in a league of 255 - 79%. Now, Ireland are obviously doing better than England at current. But a home-born quota (as is sometimes argued, although more strongly in Johnson's era) would do England no good. 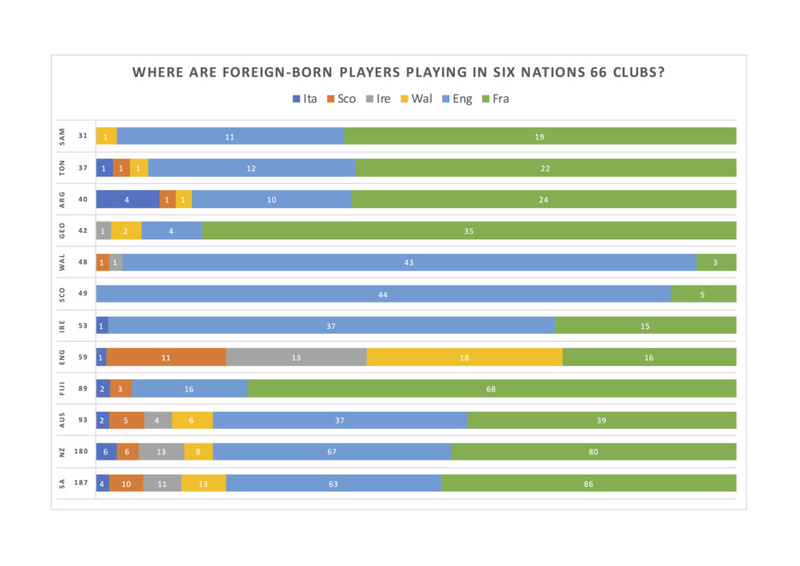 To match Ireland's 79%, we would need to replace 84 foreign players with English players. Would the 462nd best England player really add that much to Eddie's squad? Meanwhile, the league quality would suffer, as if the 462nd best England player was better than the player he was replacing, he'd already be in the Premiership squad ahead of a more expensive foreign player. 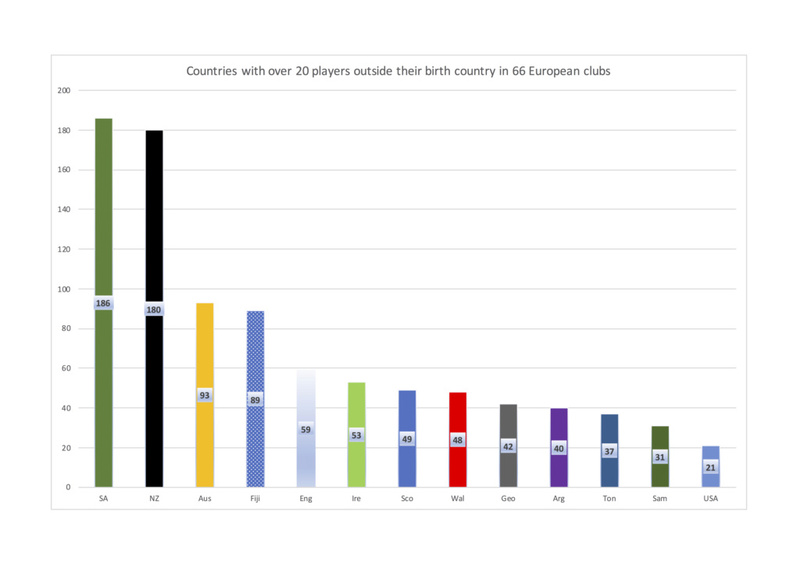 The issue is, we have ~30 current international players. That's 30 players currently playing the majority of international matches, mixing it against the best players in the World in 11 elite games a year. By consistently playing in this environment, your international players become better players. If we accept 30 as your number of current international players, Ireland have 12% of their top level domestic players as regular Ireland internationals. For England, this percentage is 4%. England have more potential Internationals, larger population, more Premiership places, more European places, but a lot of these players are "unfinished". For instance, how good could Cipriani have been if he'd come through at a club with Wilkinson? If Cipriani with all his talent could have regularly benefitted from the knowledge and experience of Wilkinson's 90-something caps, 1200 points and 2 Lions tours? For me, England have too many top level clubs. Even a reduction of 1/3 would help. 461 is far more players than we could ever consider needing. 200+ foreign players is also too many. We could happily cut that number. Drop the filler and only keep the quality players who improve the squads. Pivac or Blackadder? Dunno. Both were average. Rennie has won two super rugby titles, more than anyone coaching in the NH so i would take him over anyone. No I wouldnt take Cotter over Schmidt but thats only because hes a better coach now. Pivac and rennie are both untested internationally so rennies two titles outweigh anything either has done at this stage in their careers, but hey, what do we know about coaching. Fill yer boots. Tman just pointing out that basing how good a coach is now on what they did before while taking no thought with what is happening now is a poor thought process. Considering a NH international coach has to have a good ability to coach in the NH. If you also consider that the Champions Cup is closest to international style in terms of tactics and physically. Rennie failed last year Pivac did not. Add in that Pivac is the only coach to win a semi-final away from home in the Pro12/14 while Rennie lost his knockout game at home. robbo277 wrote: The real question for me that comes out of these graphs is: what is the correct size of a player pool? The reason England and France have 20-30 professional teams is more a fan's desire to support professional rugby rather than player numbers as is sometimes implied. Hence as you point out their need to fill the player gap with non-national players. SA & NZ have the players for more professional teams but not the fan desires. SA are seeing if there is desire. Brendan wrote: Tman just pointing out that basing how good a coach is now on what they did before while taking no thought with what is happening now is a poor thought process. Considering a NH international coach has to have a good ability to coach in the NH. If you also consider that the Champions Cup is closest to international style in terms of tactics and physically. Rennie failed last year Pivac did not. Add in that Pivac is the only coach to win a semi-final away from home in the Pro12/14 while Rennie lost his knockout game at home. Typical loser thinking. Pivac doesnt have within cooee of what it takes to manage an international side. Semis blah blah. We’ll see. Gatland to pivac? Please. Them pesky basterdes are always clinging to our damn feet, denying us our true birth right to be the best rugby nation in this quadrant of the Galaxy! Looking forward to Pivac bringing an ending of their competitiveness. 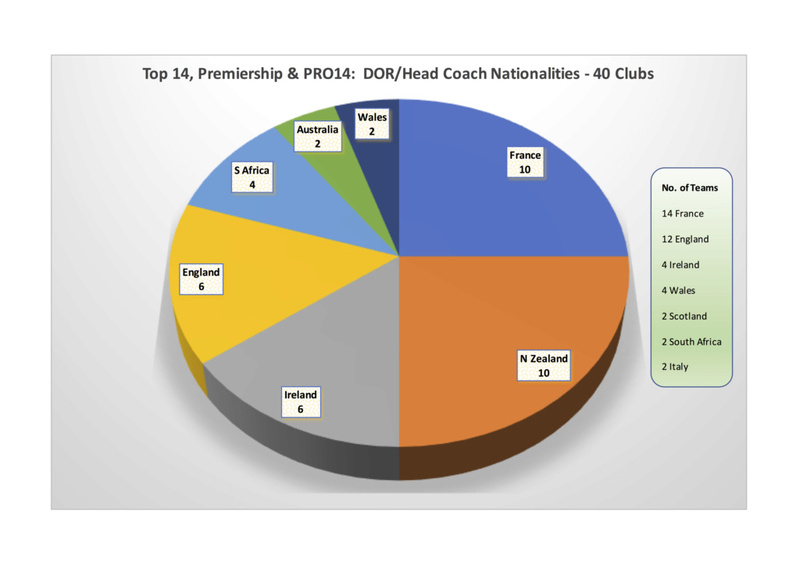 Pot Hale wrote: Someone asked me to include the Championship figures, so here's an updated chart of the numbers of pesky furriners playing across the 66 clubs in Six Nations countries. How many of the players eligible for the six nations sides themselves are ruled out from either 6N or World cup selection regardless of the reason. For example, of NZ's 180, 180 know for a fact that at this moment they wont be playing in the World cup next year for NZ, bar any changes to the status quo theyve signed up for ahead, i.e. Nonu for example. I'm not sure I quite understand your question, Tman. Are you talking about the cohort from each country that are playing outside their country? If so, then England and Ireland don't generally select from external players - unless there were exceptional circumstances I guess, like your Nonu example. France don't have any players of note playing outside France. SA, Aus, Wales, Italy and Scotland select players playing outside their unions on various criteria. Don't forget that the 180 NZ-born includes those living elsewhere from a young age, parent or grand-parent qualified for elsewhere, obtained passport/citizenship/ nationality to play in France, are too old, second or third-rank quality, etc. What do you mean when you say the demographic will change, particularly with an incoming coach? What number has peaked? The number playing abroad? 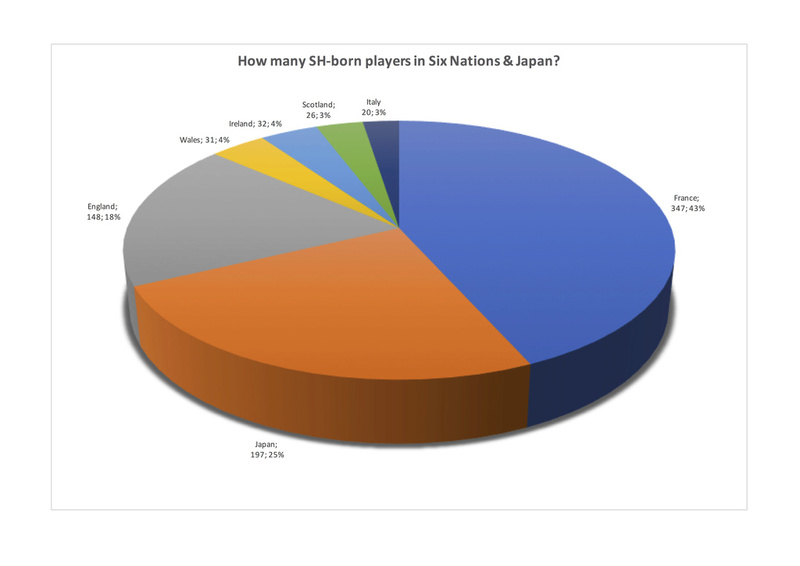 Don't forget the NZ players in Japan as well - I reckon at least half of the 197 SH-born there are from NZ. although I do think this will become a more favoured destination for top drawer NZ players due to the Aus/NZ player restrictions in Europe, less game time, and increasing money on offer in the Far East. Hi PH, I know you and I do not see eye to eye on here, but I cannot leave this without complimenting you on the work you have put into this, well done, I wish I had the time, because I know doing this type of thing is not a five minute thing. What I would be interested to know, and if I have time I might look at it using your data, is how much of a percentage of each unions recourses are taken up with foriegn players. For example, in this pie chart, you have Scotland at 26.3%, but they only have two professional teams, so is that telling us that in Scotland over a quarter of their players are not actually Scottish ? Ireland and Wales have twice the amount of teams, which means they have more players, but do they have more players from outside the country playing ? 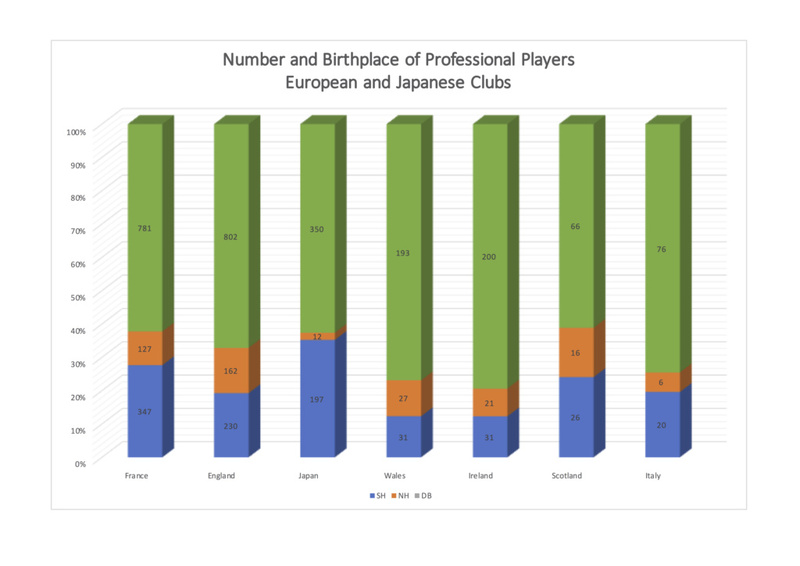 The Welsh, Irish and Scottish are not that much difference, but when you break it down to the amount of players you have available compared to the amount you do not, then it could paint a different picture, the data for France is very alarming though. Hi LD. Happy New Year to you. The two recent charts that I posted three or four above this one should have the info that you’re interested in. 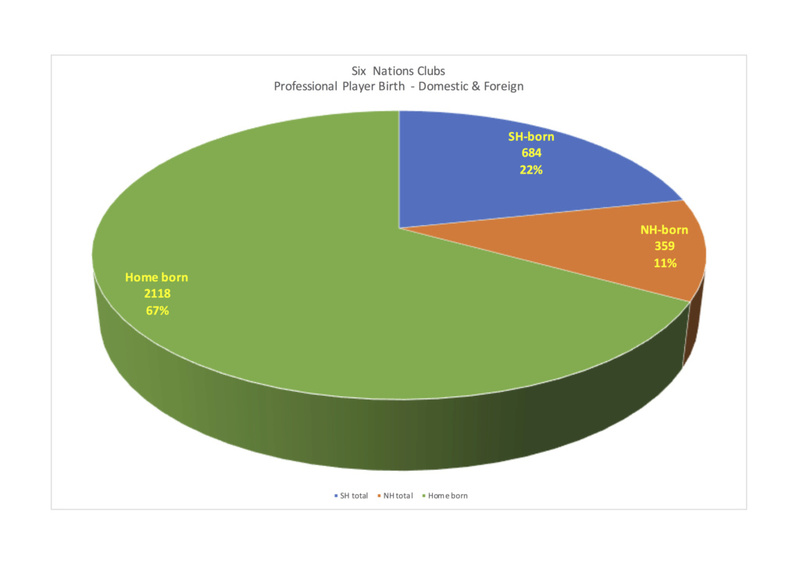 The charts information is based purely on where a player was born - nothing else like moving at early age, parents, different nationality now, residency qualification are not taken account of. If you look more closely at the pie chart you looked at, you’ll see that it actually reads Scotland 26; 3%. 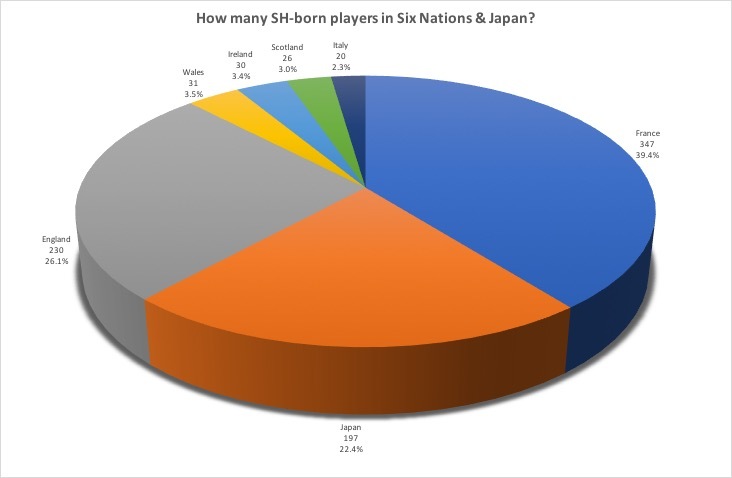 In other words, Scotland has 26 SH-born players which represents 3% of the total of SH-born players playing in 6N clubs. With the Savea saga of he signed for a French club and then backed out to sign for the NZRU means the Union is having to step in with more top players to keep them here. I also think with the rise of standards in Europe, less non European are needed. Look at the number of Irish playing overseas in France. I also think value for money has diminished when it comes to bringing in players from the south because there are more people here just as good. Brendan wrote: With the Savea saga of he signed for a French club and then backed out to sign for the NZRU means the Union is having to step in with more top players to keep them here. Was the Savea saga not more to do with NZ not really having sufficient back up at 6 after Cane broke his neck? I think it shows that the group behind Saves is no longer there. Zebo, Ryan and others were allowed to leave a long with NIQs who were "forced" out because others were below them. Scotland can afford to keep top players but don't because they have young players coming through (Russell v Hastings). New Zealand and Australia seem to be heading down the road that the Celts have come from which is your first 23 are good but then a drop off because they are younger. These unions will either need to allow players go over seas and play for the national team or do the Irish model of have your top 100 odd players at home if possible and bring back players as they reach a certain level. This would result in more 20 year olds going over seas for 3-4 years and then coming home thus keeping the knowledge in the system. The number of over 30s in Super Rugby is very low and so alot of the younger players aren't developing as fast because mentors are gone. 7. Canes a 7. So is Ardie. But yes, appears he was convinced to stay because he found not only is he reasonable back up for Read at 8 after a stunning run there, hes now likely the no.1 7 with Canes injury likely to prevent him getting back in time, and the wider diversity he brings to the role. Sometimes the misfortune of others provides a break, Savea has gone from reserve to dead certain Wcup squad and likely starter in six months. They worked that one through well. Geez that last sentence is a wide assumption, yet to be proved. The drop off is more due to the younger players not developing into test players as fast but thats also had the effect of getting them up to speed much quicker. ‘Drop off’ is difficult to assess. We picked a raw as can be side vs Japan and thrashed them, where England struggled. Theres a lot more to that that attributing it to mentors in the way you have here. Players learn quick these days, the problem is you have to have them. Oz dont and would struggle even more to bring them through if tgeir pros returned from the north. From what I can tell in SR it is generally your starter players most weeks. As you say Savea has had a quick rise but are all the youngsters getting those chances against good teams or is it that they are waiting for an injury. Going by how well SH coaches do at rotation their first season in the Pro14 I would say it doesn't happen much. Yes NZ has players coming through all the time and we use the Maori AB's, 7's, Super squads, and even AB's as we did Japan to get them out there after they show promise at schoolboy, U20, Mitre 10 cup level. We have Stephen Perofeta and Dillon Hunt showing good progress at 7 at SR level so as long as they keep turning up we're ok. The battle with keeping the right ones from the north is ongoing and theres a bit of luck there at both ends how it all pans out for a player. Are our Super sides compromised because of the drift, probably, but the all time record low quality players coming through in Oz make it look not so bad. When 30 year olds are your only best players theres definitely a problem. Hooper, Pocock, Genia, Folau, Kepu etc still the go to players. Not good. Taylorman wrote: Yes NZ has players coming through all the time and we use the Maori AB's, 7's, Super squads, and even AB's as we did Japan to get them out there after they show promise at schoolboy, U20, Mitre 10 cup level. We have Stephen Perofeta and Dillon Hunt showing good progress at 7 at SR level so as long as they keep turning up we're ok. The battle with keeping the right ones from the north is ongoing and theres a bit of luck there at both ends how it all pans out for a player. Yes back in 2015, prior to player exodus going nuts, not so much now. The Ioanes, younger Barretts, Goodhues, have had to step up at 19 and 20 to give the AB's any chance. Problem with Oz is four years later they are still relying on our McCaw, Carter equivalents, players now around for a decade. We now have new oldies, Whitelock, Ben Smith, Retallick, Franks and you'd expect that level of maturity. Most squads are now younger across the board due to the club ripoffs and as Ive been saying all along its not healthy for International rugby to have normally successful sides depleted because of it.